I previously noted that the demand for libertarian terrestrial talk radio is increasing, and the supply of libertarian hosts on terrestrial talk radio is far lower than demand. Today, I've come across additional data that suggest that libertarian talk radio has great potential. Terrestrial music radio is hemorrhaging listeners, and many under-performing music stations are switching to the relatively-more popular news/talk format. In other words, the demand for news/talk programming is increasing. While demand for news/talk programming is increasing, terrestrial news/talk radio as a whole, which is currently dominated by conservative hosts, is losing listeners. According to RadioInsights, more than half of news/talk stations lost market share in each of the last 3 years. 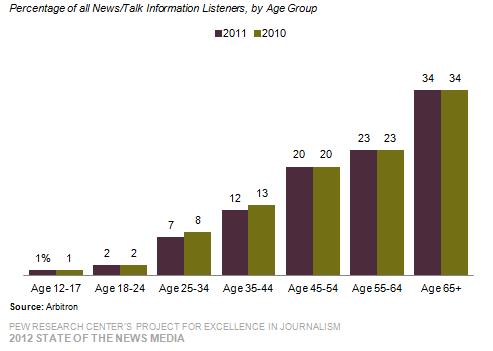 News/talk listenership has been flat for years: the format has approximately the same number of listeners today as it had in 2007. The majority of libertarians, on the other hand, are young--and therefore more valuable--to advertisers. 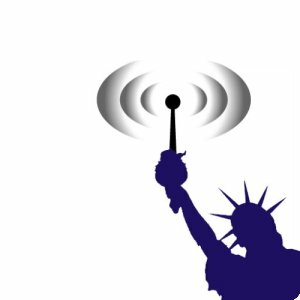 Libertarian talk has great potential in the online format as well as on terrestrial radio. While terrestrial radio is losing listeners, Internet radio is rapidly gaining listeners, and the number of listeners of online radio is expected to equal that of terrestrial radio in the next few years. The online talk radio format is better suited to libertarians than conservatives, as the former tend to be younger and more tech-savvy than the latter.